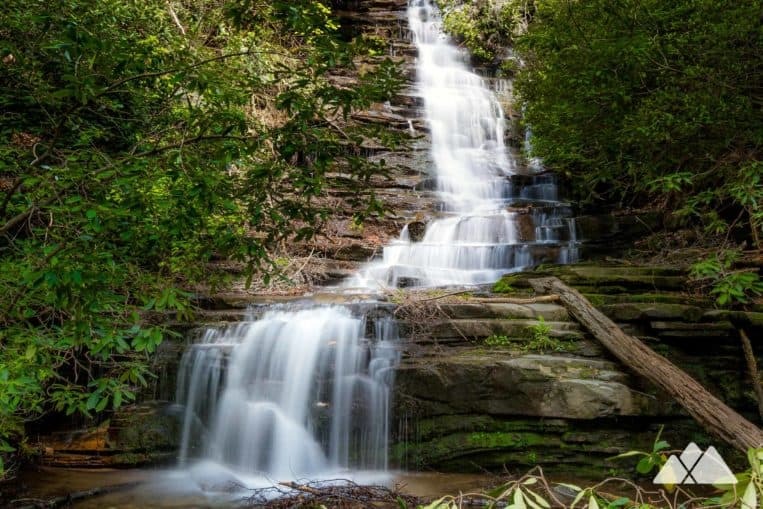 Hike the Angel Falls Trail at North Georgia’s Lake Rabun Beach campground to two beautiful waterfalls, Angel Falls and Panther Falls. Near the historic lakeside town of Lakemont, the Angel Falls Trail explores two tumbling waterfalls, Panther Falls and Angel Falls, in a beautiful creek valley. 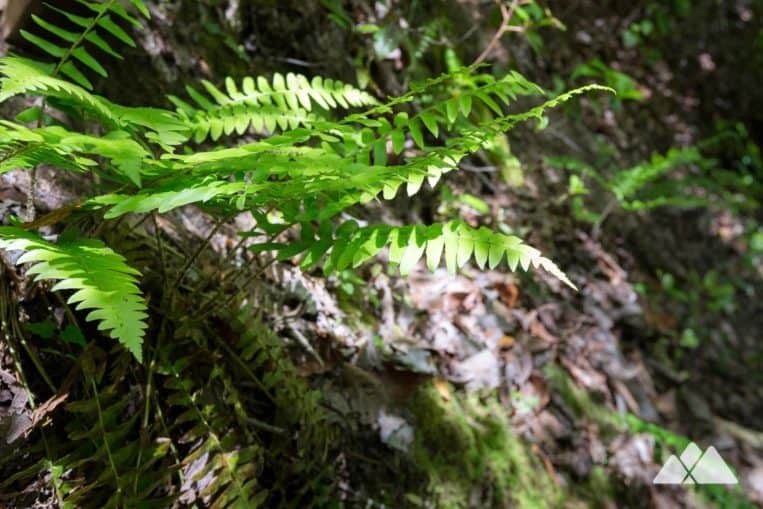 Hiking less than two miles, round trip, the trail is a fantastic family-friendly hike for campers at the Lake Rabun Beach Campground, and worthy of a visit for anyone exploring the namesake lake of Rabun County. Nestled deep in rolling mountains, Lake Rabun’s winding shoreline and glassy waters are a favorite North Georgia destination for hiking, boating, kayaking, and camping. Just below the lake’s dam, the Tallulah River plummets in a series of enormous waterfalls deep in the steep-walled depths of Tallulah Gorge. 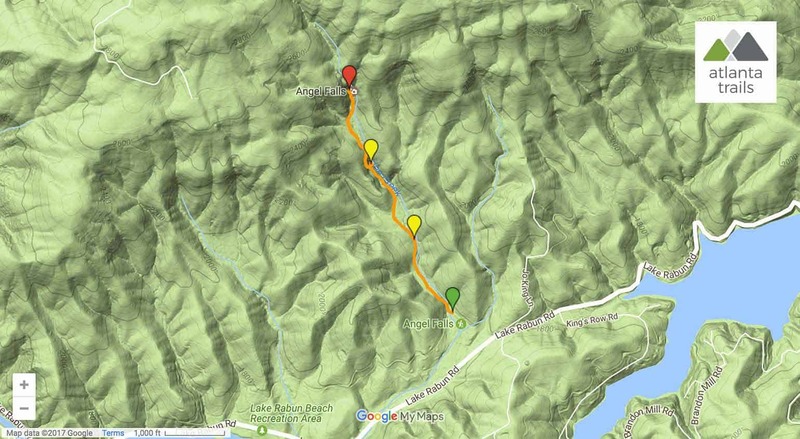 The adventure begins at a trailhead in Loop 2 of the Lake Rabun Beach Campground (view maps and driving directions). The trail follows Joe Creek upstream, crossing a wooden bridge and catching sight of a small, multi-tiered waterfall near the trailhead. The hike ascends stone stairs, climbing elevation into a sun-dappled forest filled with fern, rhododendron and mountain laurel. The hike continues to ascend, with Joe Creek tumbling over a rocky creek bed on the trail’s right side. 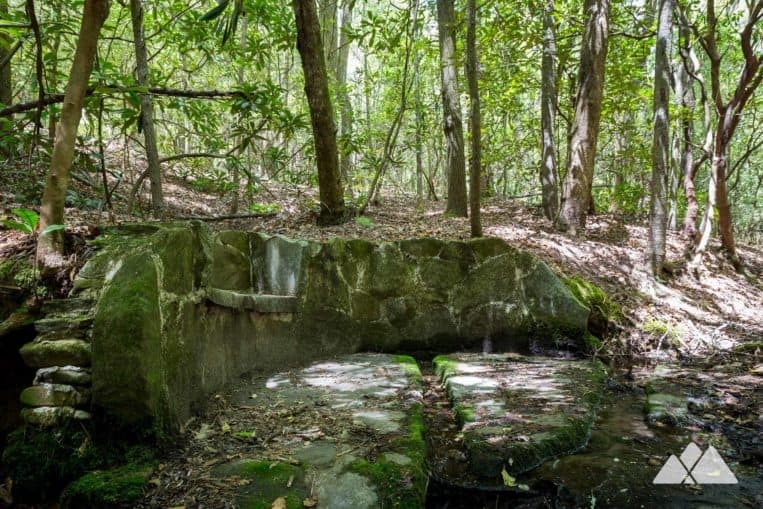 The hike reaches a historic, moss-covered stone bench at .3 mile, built by the Civilian Conservation Corps at the site of a small spring in the early 20th century. Now diverted, the spring once flowed through the stone channel below the bench, a source of water for the nearby CCC camp. The trail passes a large, rocky, mossy outcrop on the right before crossing two bridges, and the sound of tumbling water grows louder. The trail reaches Panther Falls at just under .6 mile, where Joe Creek cascades down a stair-stepped rock outcrop into a tranquil pool of water below. Departing Panther Falls, the hike hangs a right, climbing the trail’s steepest stretch through a sharp switchback. (Metal cables serve as a safety railing on this stretch of the trail; take extra caution with dogs and children.) The hike climbs, reaching a trail loop; a turn in either direction leads to Angel Falls. The trail reaches this hike’s second waterfall at .9 miles, catching views of Angel Falls from a wooden platform. Above, the waterfall cascades down over an angled, multi-tiered rock face framed in leafy rhododendron. Departing the waterfall, the hike retraces its outbound steps to the trailhead. 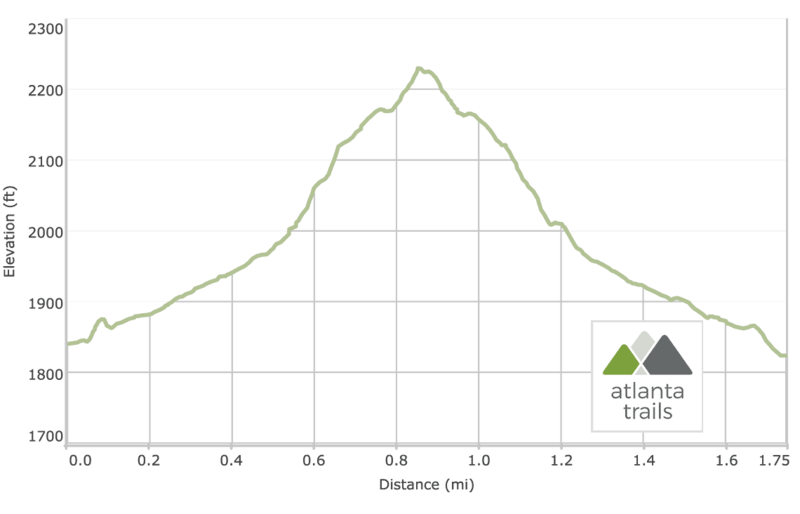 The hike reaches the trailhead at the Rabun Beach Campground at 1.75 miles, finishing the adventure. In the area and up for some more waterfall-chasing adventures? Don’t miss the nearby Minnehaha Falls just north on the Lake Rabun shore, a shorter hike to a much larger waterfall. 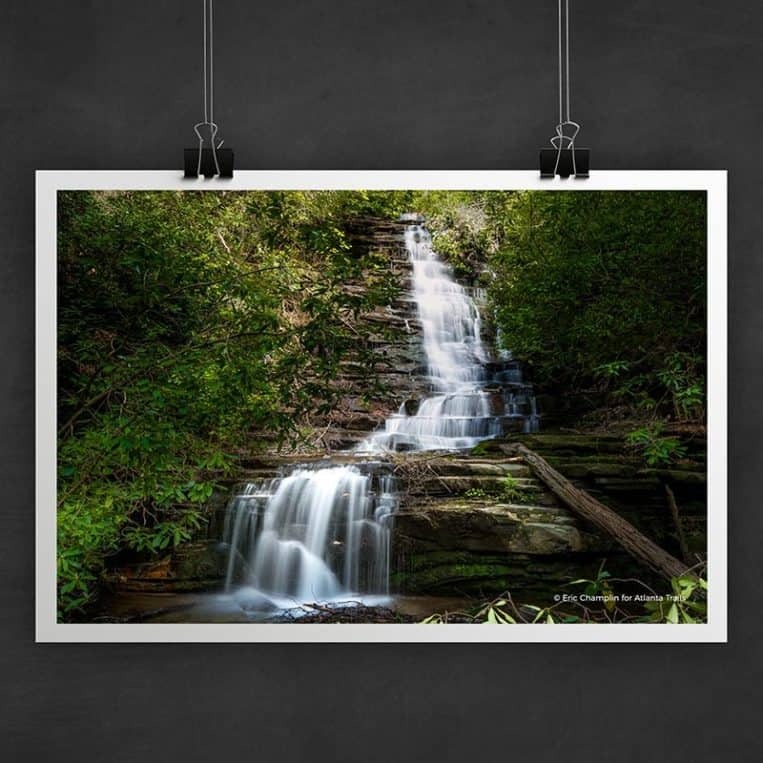 And further north, a beautiful waterfall cascades down into a shady creek valley near the shores of Lake Burton, reached by a popular 2-mile hike on the Hemlock Falls Trail. $4 (daily). Camping at the Lake Rabun Beach campground? Walk to the trailhead and save the parking fee.